To say this is long overdue is an understatement. Incase first sent me their Skate Messenger Bag back in May. Yes, May. 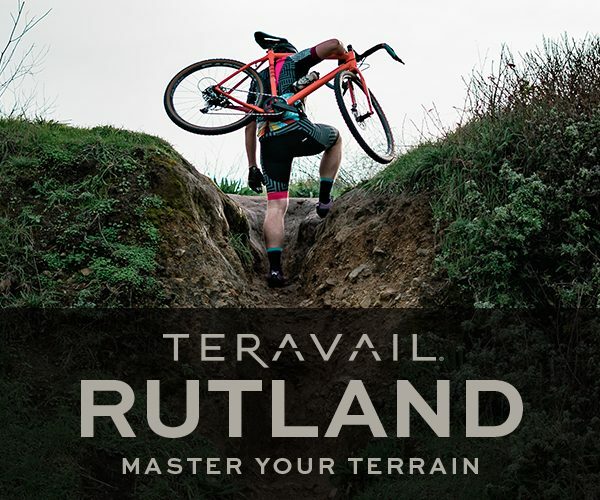 I used it throughout most of the Summer months and still use it when I need to travel, carry home some loads from the office, or take bike parts to a shop. I guess that’s one of the good things about a delayed product review; it really lets you use the product for an extended period of time and allows you to really break it in. 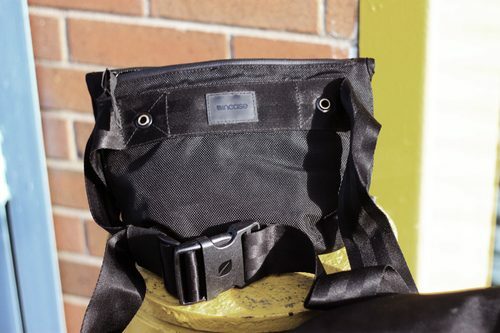 To start off, this bag is filled with details designed around urban cyclists, commuters and couriers.There’s a 3M flap at the bottom of the main compartment flap and 3M accents around the stash pocket. The hardware is resilient and regardless to the abuse I’ve given it, has yet to snap or break. 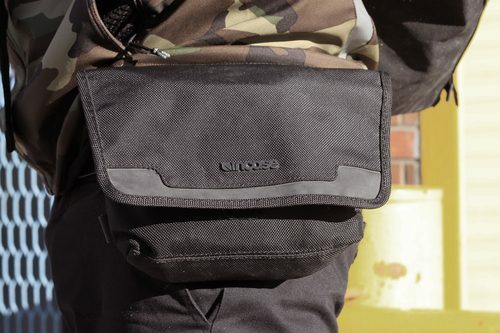 Like all of Incase’s products, the Skate Messenger Bag has small, subtle branding. No gaudy logos or graphics, just a sleekly-designed bag clad in a waterproof nylon shell. 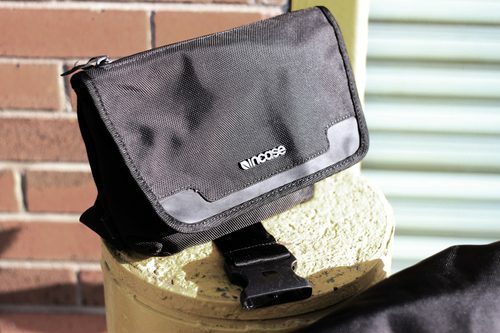 The Skate Messenger Bag is part of Incase’s Courier Collection. Included in this collection are the Messenger Bag, the Skate Messenger Bag and the Messenger Hip Pack. When Incase teamed up with HUF and DQM to produce their limited, NYC and SF-themed bags, they decided to make an all black colorway of the silhouette. 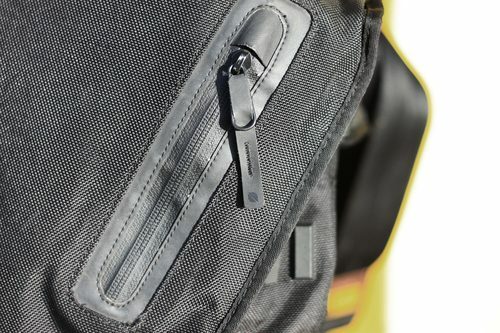 The major difference between the Skate Messenger Bag and the Messenger Bag are these Velcro straps used for securing a skateboard to the bag. 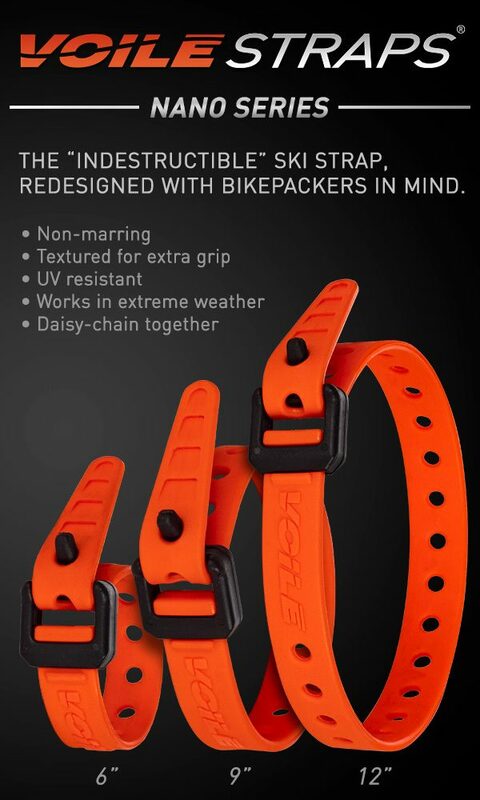 The detailing of this strap system is really well thought out. The little rubber bumpers on the bag protect the custom weather resistant 1680D nylon shell from being damaged by the grip tape. Since I don’t really skate anymore, I never used these straps for their intended purpose, but I did find them really useful when hauling a bike frame home. Or for carrying wheels. There’s a nice velcro strap to hold your u-lock, which I never really used. 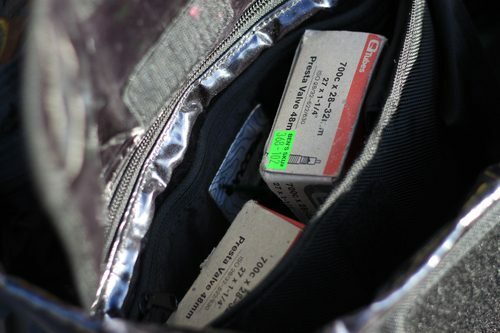 It was always easier to back-pocked it or stuff it in the bag’s compartment. Probably the most impressive thing about the bag is the detailing and branding incorporation. The straps themselves have some of the most comfortable padding I’ve ever used. The annodized alloy hardware is a nice touch too; really secure cinching system. One thing to note is that the bag is ambidextrous, allowing you to make it a right-handed or left-handed bag by swapping the pads and cross-strap. More on that later. 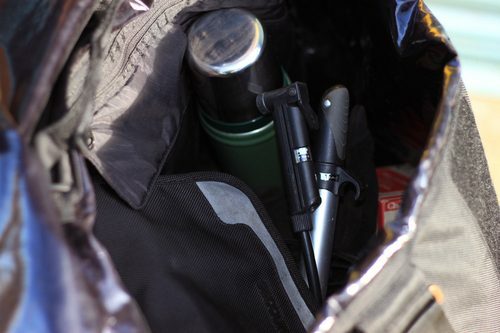 The bag is fully waterproof, including this exterior stash pocket. Which I mostly used for stickers and other small items. Inside the bag are a series of zippered and Velcro enclosures. The large laptop compartment is lined with a fake fur and can fit up a 17″ laptop. There’s plenty of room inside the main compartment. I never had an issue carrying my daily needs around, or my dog for that matter. You can kind of make out the subtle topography lines printed on the inside of the bag in this photo; another nice detail in the bag’s branding. To light the interior up a bit, I popped a flash in this photo, which illuminated the 3M coating on the hip pack that comes with the Skate Messenger Bag. Some more shots of the compartments. There’s a nice pump Velcro strap too. I never used it though. Not that there was anything wrong with the design, I just found it easier to toss my pump in the main compartment. 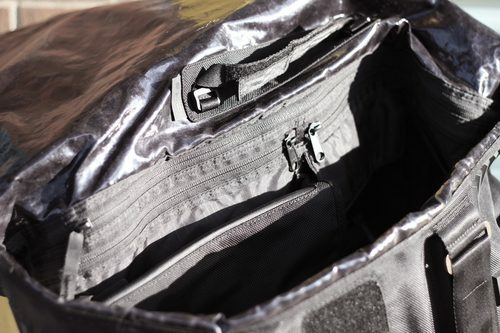 Here you can also see the hip pack buttoned into the reinforced interior. Again, the hardware is durable and really ergonomic. Each side of the bag has an eyelet which the cross-strap attaches to; the strap that secures the bag from sliding around. Depending on if you need a right or a left-sided bag, you can switch the pads and this strap to convert the bag to one side of the other. A lot of thought went into this system. Unlike other bags, there’s no need to specify whether you need a right or a left sided bag. Here’s the hip sack that comes with the Skate Messenger Bag. 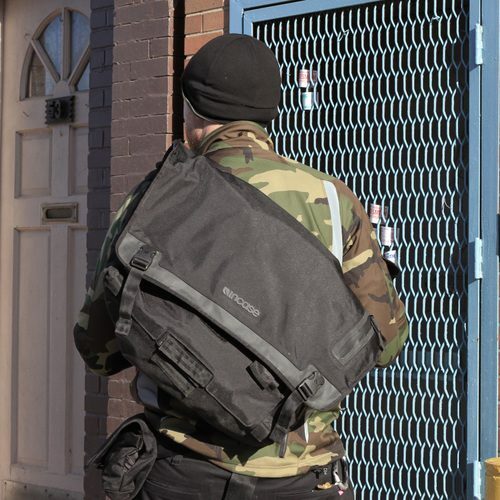 Now, again, it’s detailed slightly differently than the Messenger Hip Pack. There’s no u-lock holster on this one. Which as I said before, I would just back-pocket or belt-loop the lock anyway. 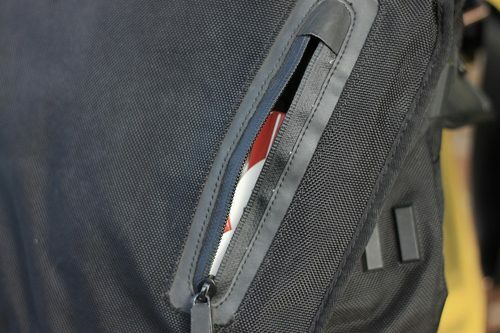 Here you can see the buttons that attach to the interior of the Skate Messenger Bag. I honestly use this hip pack everyday, but not as a hip pack, as a tool pouch. It fits all my tools and two tubes inside with no issues. When I want to ride in the neighborhood, but don’t feel like taking a ton of stuff with me, I’ll use the hip pack. It fits everything I need and has a fake fur-lined pocket for a cell phone. The nylon buckles are again, very durable. My only complaint with the pack is that the straps aren’t removable. It’d be nice to at least have the option for lacing your belt through it. One really smart detail is the zippered top. It allows you to access the bag without opening the main flap. Comes in handy when you want to open it up quickly to get your phone or your camera. 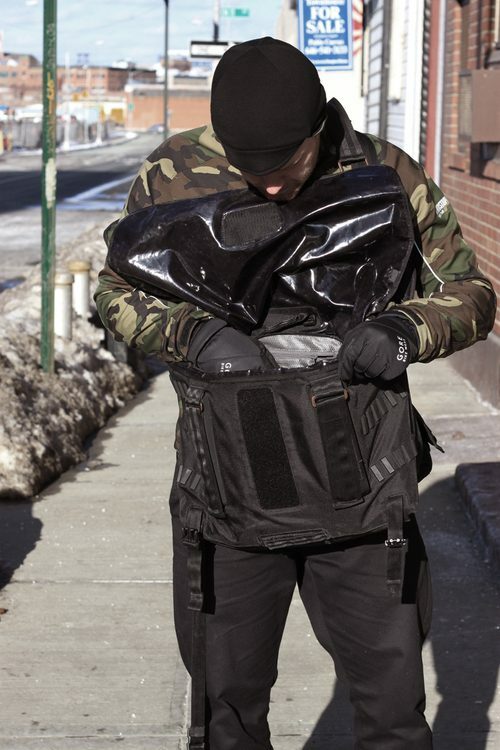 The hip pack fits everything you need without being too bulky. To give you some reference for the size of the Skate Messenger Bag, here are a few shots Luke took of me wearing it, with the hip pack on my side. One of the main reasons why I liked this bag so much was the size. A lot of standard-sized messenger bags feel small to me. I’m a bigger guy and this bag felt perfect. 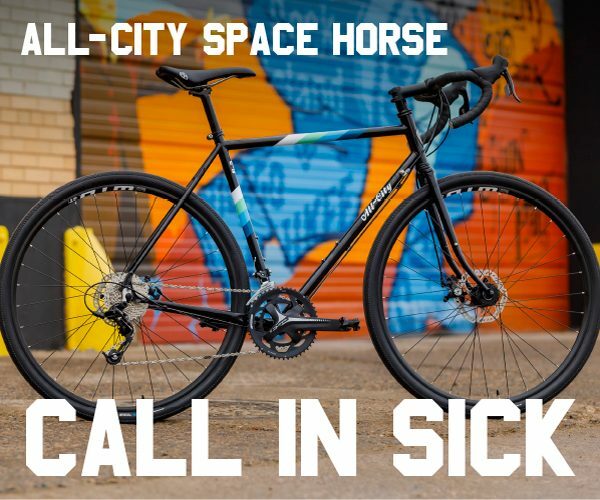 That being said, It may be a little large for most riders. It’s a tough niche to fill but I think the size of the bag is perfect. The bag is probably about 30% full at this point, to give you a bit of a reference to its silhouette when filled. 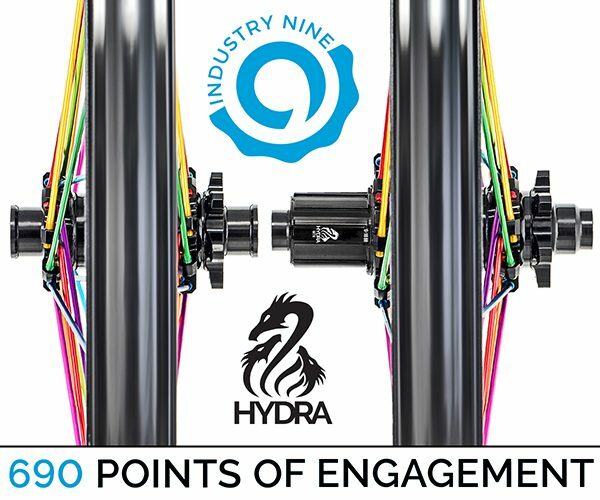 The hip sack is around 80% capacity. Again, due to the ambidextrous design, it can be assembled to be either right or left shoulder specific. And a close-up of the hip pack included with the Skate Messenger Bag. 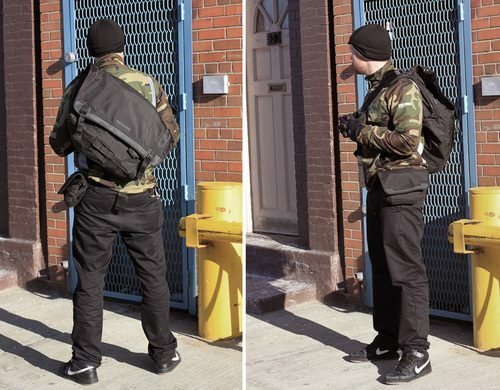 Like all messenger bags, is easy to access when you need to. This leads me to one critique; the closure method. 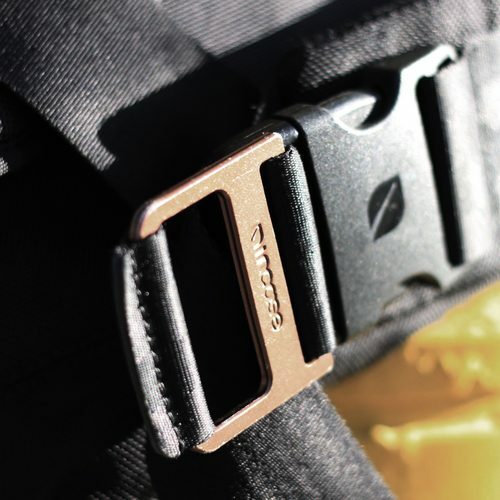 The buckles are perfect, but because of the skateboard straps, the main flap has only one Velcro strip for closure. This is enough to keep the bag closed, but the sides of the bag kinda flap around if you don’t buckle it closed. 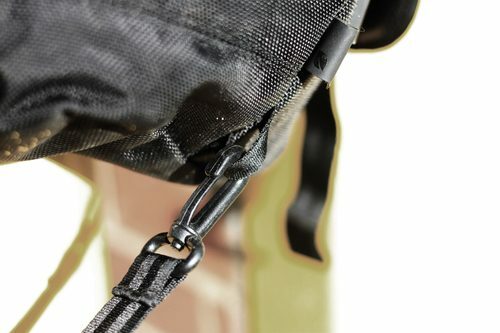 Most messengers will keep their buckles open while making runs to make it easier to get in and out of the bag and if this center stip is the only means of securing the flap with Velcro, it could get kind of annoying, especially when filled. Also, the cellphone holster that comes with the bag worked well for about a month, then the Velcro closure wore out and I lost my iPod and iPhone a few times. Luckily, they weren’t damaged, but if you plan on buying this bag, you may want to use a different holster. Another small complaint is the length of the closure straps. I found a few times when I had to tote something bigger around, that an additional 6″ – 8″ of strap would have been useful. It’s a small thing and only a minor design flaw. Overall, the Incase Skate Messenger Bag is definately one of the better messenger bags I’ve used. The straps are definately the most comfortable and as you can see, after about a year of use, it’s still in one piece. Granted I’m not a messenger, so I can’t put it through the same test as they could, but friends of mine who are messengers have used it and generally had the same critiques I had. I emailed Incase my criticisms last Fall and they forwarded them to their designers. 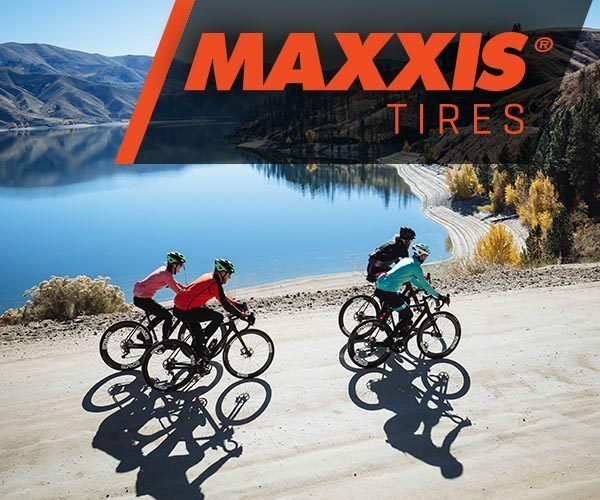 Not sure if these will make it (or have made it) to future production runs, but they were great about communicating to their consumer base (me). 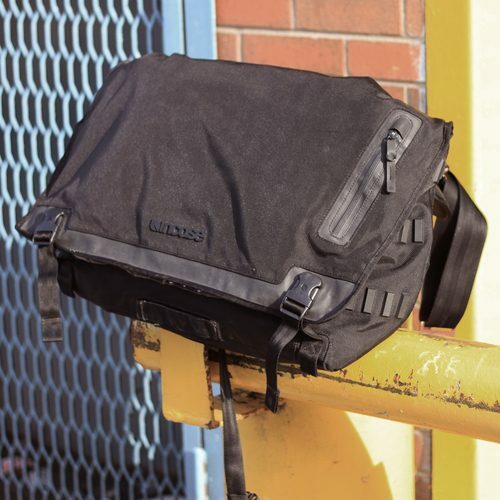 After using this bag, I have purchased other Incase products (their digital SLR case for example) and I’ve been more than pleased with the construction, price and detailing. They really do a bang-up job at addressing a market niche. 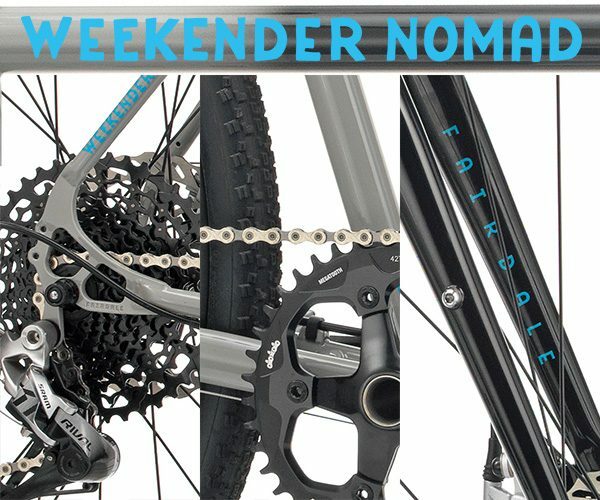 Even though this review is a bit late, hopefully it’s been helpful in answering any questions you might have had about it. 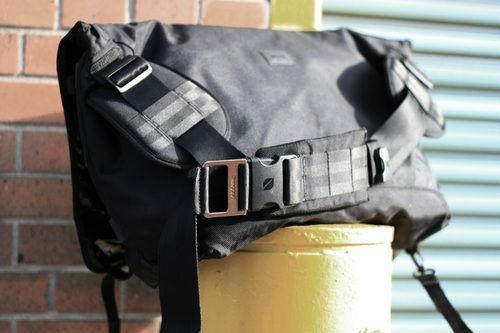 For more product reviews, shots of their bags, photos and video, head to the Incase website’s Courier Collection page. 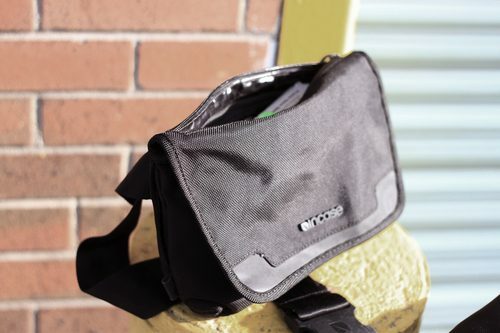 They’ve done a much better job at photographing the Skate Messenger Bag details and I can assure you, their product shots depict the bag in a new condition quite well. 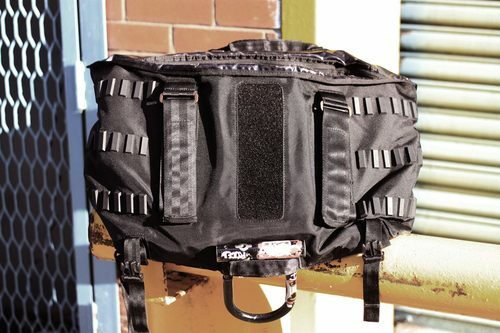 If you have this bag and would like to add anything to this review, feel free to do so in the comments.